We can quickly and effectively analyse a site and give an indication of its potential. This can be steered by what risk you want to take on, and how your prioritise cost, time and quality, to arrive at a clear picture of what we expect your development will cost, and what it will offer in return. 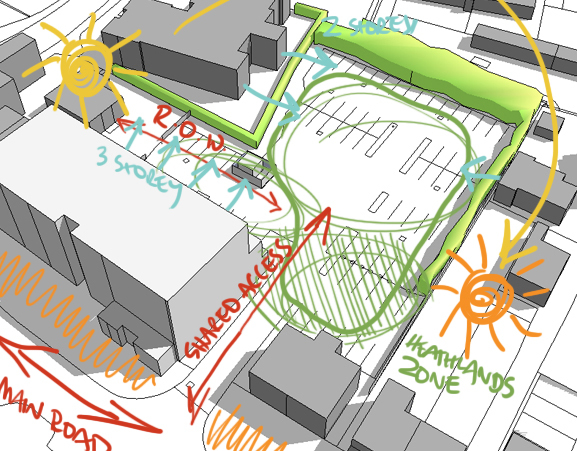 Normally for this service we would provide some sort of sketch showing an indicative layout of the site, perhaps some sketches to illustrate a particular aspect, or a few options to show different ways the site could be developed. This would liekly be accompanied by some calculations or figures advising what can be fitted on the site - is it two semi-detached houses with three bedrooms each? Or is it 235 flats with a 40-60% mix of 1beds and 2beds? We tell you what can fit, and if you wish, we can advise on likely cost of the building or entire development, from fees to VAT. We were brought a site, where the previous owners had failed repeatedly to gain consent for a new house. The site was tight and overlooked, and the planners were resisting the mass offered by a traditional house. By combining technical skill, planning knowledge, and creativity, we were able to design an unconventional house that looked like a bungalow from the street, was arranged to avoid any windows on the overlooked side, and partially sunken to still provide enough bedrooms. A £40k piece of land was turned into a £240k building plot. Our fee for the planning work was £8k. We look at the site and its situation from a new perspective. This may involve modelling (as shown) or sketching over a photo, satellite image, or map. By doing this we see the site clear of current constraints. We bring skill and creativity to provide ideas that maximise the potential of the site. 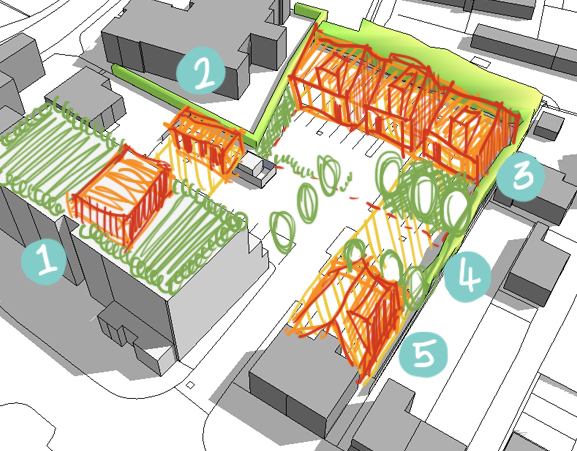 Looking at the access, sunlight, overlooking, local amenities, neighbouring building relationships, local architecture, pattern of development, and anything else of value, we establish which areas of the site can be built on, and where you might need parking, or bin stores, or trees, or garden. We know what are the likely reasons for planning or neighbour objection, and design in ways to work around them. By taking account of these constraints, we are able to discuss the various options you have available on a site, and ideas like phasing and a possible planning strategy if the development will not be straight-forward. 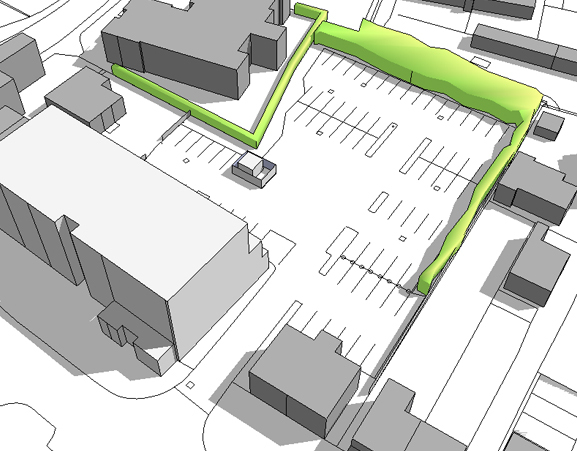 We produce clear, accurate drawings that quickly give you a direction on the project. We are pleased to say that once a client has seen the value we bring at this early stage, they will almost always continue to work with us to capitalise on their site, and trust us to deliver good value for money. 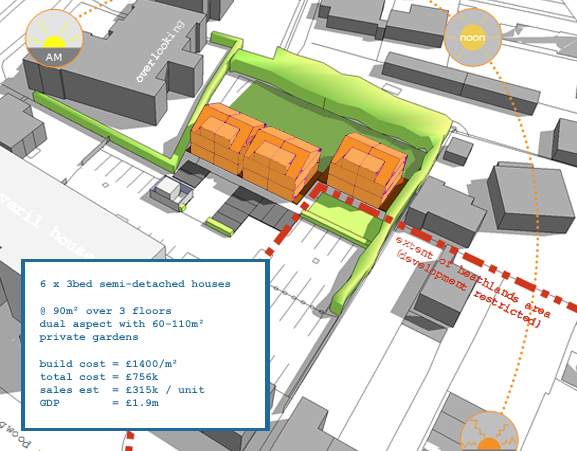 If you have a site, whether a piece of land, a building, or a whole development with ongoing users, and would like to know the ways you can get more value from it, drop us a line. We're always keen to hear about new projects and exciting challenges.